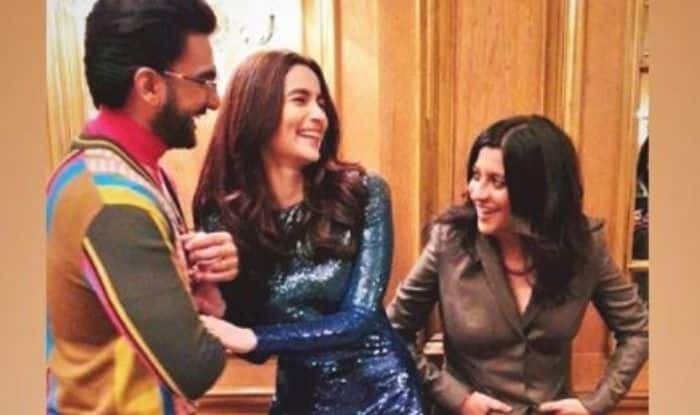 One of the most anticipated films of the year Gully Boy, that stars Ranveer Singh and Alia Bhatt will is be screening at the Berlin Film Festival 2019. The actors are currently at the venue and cannot stop sharing pictures of them having fun on social media. The two actors were accompanied by the director of the film Zoya Akhtar. All three of them, took to their Instagram to share pictures from the Berlin Film Festival and in the pictures they can be seen dressed in their best. They sure did have a ball as they giggled while getting clicked. Alia looked gorgeous in a shimmery blue bodycon dress which she teamed it with a pair of silver shimmery heels. Ranveer, on the other hand, was extra as always. He looked dapper in a furry overcoat. Zoya kept it chic in a grey pantsuit. Alia and Ranveer were earlier spotted at the airport as they headed to Berlin. Ranveer, as always, looked dapper in red joggers and a red hoodie and teamed it up with white a pair of sneakers and funky sunnies. Alia, on the other hand, sported black baggy pants and a cropped jacket of the same colour. The trailer of their film Gully Boy received a lot of positive response from the cinema lovers. Ranveer and Alia will be seen together on the silver screen for the first time and people have high expectations from the movie. As there is no big release in coming week, chances are high that it will perform well at the box office as well. In the film, Ranveer will be seen playing the role of a rapper and Alia will be playing his love interest. 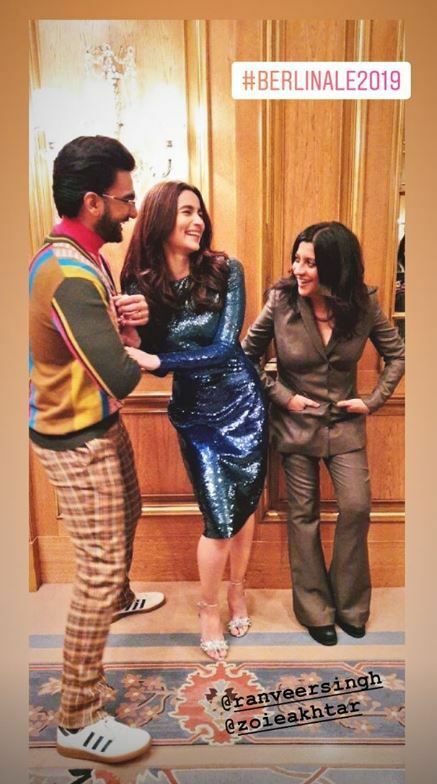 While speaking at the trailer launch of the film, Ranveer stated that he would have burnt with jealousy if the film had any other actor instead of him. He said, “When somebody told me about the script of Gully Boy, I told them that it is my film. If any other actor would have been a part of this film instead of me then I would have got burnt with jealousy. I was born to do Gully Boy and I knew only I can pull off this character”. Apart from Ranveer and Alia, the film also features Kalki Koechlin. Directed by Zoya, it is all set to hit the screens on February 14.